Love and duty collide when Taya is appointed attaché to Ondinium's first exalted ambassador and is soon plunged into a sinister world of secrets and lies. After the diplomatic contingent’s hasty withdrawal from Mareaux to avoid an international incident, Taya's faith is shaken by a disastrous crash and a tragic murder, which reveals just how much she has to lose. Now, if she's going to fulfill her duty to her nation, she must risk everything she cares about. 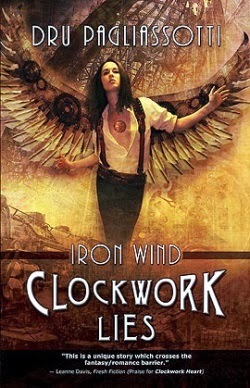 As the winds of war whip around Ondinium’s borders, Taya’s metal wings must bear her through storms, gunfire, and explosions as she fights to save them not only from their enemies, but also from their own government — a government that regards them as nothing more than clockwork cogs in a ruthless political machine. Click here to read the free chapter one excerpt. 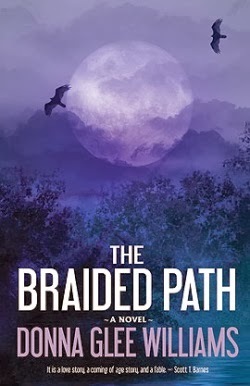 THE BRAIDED PATH by Donna Glee Williams is the second title. In the press release, the author describes her novel as a "multicultural literary fantasy." Having not read the book, I’m not completely sure of its sci-fi romance status. However, the premise reminded me very strongly of the Juan Solanas' UPSIDE DOWN, which is definitely a sci-fi romance (I blogged about that film here). Perhaps the worldbuilding of THE BRAIDED PATH is science-based? On the slopes of a vertical land where people’s lives are bounded by how high and low they are able walk on the single path that connects their world, the young widow Len Rope-Maker watches as years go by and her son Cam never finds his limits. Long past the time when other youths in Home Village have found their boundaries, Cam keeps climbing higher and lower, pushing on with his sweetheart Fox who also shows signs of being a Far-Walker. But Cam’s drive to venture far nudges him towards the top of the world, while Fox’s sends her downward, toward the mythical sea at the bottom of all things. Both are true to their own heart’s calling.